Home owners are always observing the latest trends in home design as they update their present home, or plan to build a new home. Updating a home’s major rooms such as kitchen, bath, and master suite is also important in a seller’s staging to sell. Buyers always want to have the latest designs and technology in homes they purchase, intending to live in them for many years. One area that is changing in the Lake Oconee area homes is the bathroom. Some major trends are occurring in bathroom fixtures, technology, and design. I have chosen a few of the major trends that we see here in Lake Oconee that improve a Master Suite. Instead of the bathroom being a closed off area separated from the bedroom and closet, the new trend is to merge all or some of these areas to create an open space. The photo above shows a vanity, tub, and closet area that are not separated from the bedroom by a door. There is a move away from the large spa tubs that use great amounts of water and space in the bathroom. The preferred new style bath tub is a free-standing tub that often has curves in the design. 3. Larger showers with sound systems Modern showers are often built large enough for two people, and sport multiple shower heads. Sound technology has come to the bathrooms providing personal playlists to entertain during one’s morning shower. The resurgence of Modern styling is expressed in a bathroom by the use of “floating vanities” which may be attached to the wall. These vanities are often personalized to fit the home owner’s needs. Two other benefits of floating vanities is that they are easy for cleaning the floor area, and are wheelchair-friendly! saving design for toilets The continuing use of water saving features is ever popular in bathrooms. “Engaging” lighting such as lights that automatically come on when someone enters the area, and better lighting over the vanity improve the new bathrooms. One fixture that I find surprising, but useful, is a partly refrigerated medicine cabinet. For today’s lifestyle, a refrigerated cabinet is useful for some medications or organic beauty products. If you are looking for a Lake Oconee Home, call us and we’ll tour the available homes for sale with an eye on the updated master suites and bathrooms! Sign up to receive new Look@LakeOconee posts by entering your email below right. 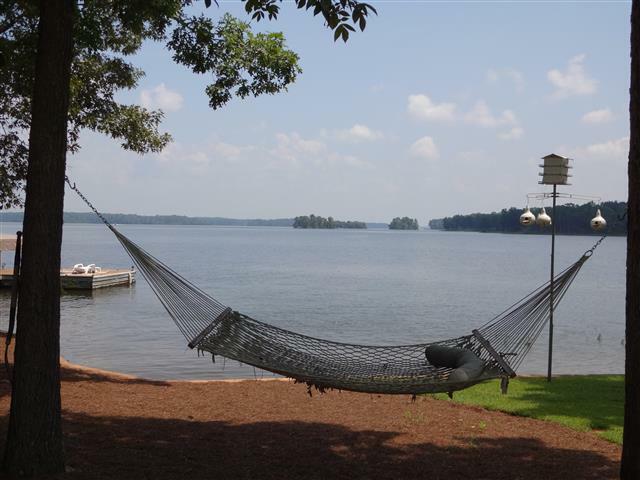 Living here at Lake Oconee is like a vacation! There is always something fun to do, even though we enjoy a relaxed pace. Come visit and see local property for sale. Now is a great time to buy before the mortgage rates and the home prices rise. We have compiled a partial list of events planned for Lake Oconee visitors and residents to enjoy during the Holiday Season. If you are considering buying property in the Lake Oconee area, this list may give you an idea of all the activities that are available here, in addition to the ones that are only an hour away in Atlanta. Links are included to get more information about each event. For more information about any Lake Oconee Homes for Sale , call Suzie (706-347-1115) or Jim (706-453-6253) Through our Multiple Listing Service, we have the key to any home for sale. Next Christmas, spend the holiday at your Lake Oconee Home. Why Buy a Townhouse at Lake Oconee? There are many reasons to buy a Lake Oconee Townhouse. Lake Oconee offers many housing styles for the buyer including a variety of townhouses and condominiums, both inside and outside gated communities. What is the difference between a townhouse and a condominium? A condominium is a form of ownership, the owner does not own the exterior wall, roof, or ground. A townhouse is more a style of building, usually more than one story that may be in a row, in which the owner is responsible for exterior maintenance. However, a condominium may also be a townhouse in style. In a condominium, all the exterior maintenance is performed by a HOA (Home Owner’s Association) to which each individual owner contributes periodic fees. Why buy a condominium or townhouse? A few negatives of a condo or townhouse are that there is often shared uncovered parking, and sometimes there are restrictions enforced by the HOA. There are condominiums here at Lake Oconee in all of the gated communities, the lake communities, and the residential towns. Two of our listed townhomes are in the golf community of Harbor Club. 1115 Wharfside Court (pictured above and to the right) is within the Lake Villa section. Both of these townhomes are within the gates of Harbor Club, so offer extra security, and also other amenities with memberships. For more information on these and other Lake Oconee Townhouses, contact Suzie Hudson 706-347-1115, or Jim Hudson, 706-453-6253. Lake Oconee is a prime destination for retirees, or future retirees! Many people buy a second home here in midlife with the intention of retiring here. When living in a single family home becomes problematic, people choose to live in apartments where assistance is available, yet where independence is possible, also. I have detailed the opportunities that Lake Oconee provides for life stages in previous posts, stating reasons that Lake Oconee is a Good Place to Retire and New Adult Communities. This year we are happy to welcome 3 new facilities that will make the Lake Oconee community one in which all future senior living needs will be better met. The Lake Oconee Community has long been served by the assisted living development of Savannah Court and several local nursing homes. This year the addition of two new assisted living communities under construction in the heart of the lake area will provide even more choices for living styles. Jim and I moved here when our two children were still living at home in 1990, and loved it so much that we have decided that this will be our future retirement place. We have seen so many improvements added to the community, and highly recommend it as a place to live the rest of your life! Do you like to Live Large? Here is the house for you on the shores of Lake Oconee! Everything about our new listing on Lake Oconee is Large. Most buyers coming here want a “Big Water View”. With 170 feet of waterfront, this home on Long Island Drive in Eatonton, Georgia has an inspiring view! Already equipped with a hammock, here is a space to nap, watch boats go by, or ponder the meaning of the universe. Do you like to Live Large by having lots of friends and family visit in your home? This Lake Oconee home has space to feed large numbers with its separate dining room, large breakfast area, children’s corner, upper deck dining area, and terrace level table. There are grilling areas on the upper deck, and lower patio, and both have eating space, too, so cooking and dining can all be al fresco. Speaking of cooking, the gourmet kitchen is large-sized and includes a wine storage rack, custom cabinets, and granite counter tops. There is a kitchenette on the Terrace Level to make refreshments convenient for guests and lake goers. The family can all gather in this large Great Room on the main level. There is another one just as large on the Terrace Level! 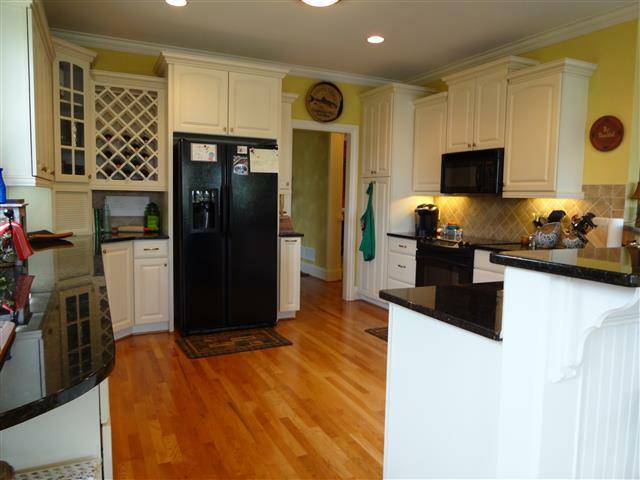 Many rooms of this home are upgraded with custom molding, custom finishings, and trey ceilings. 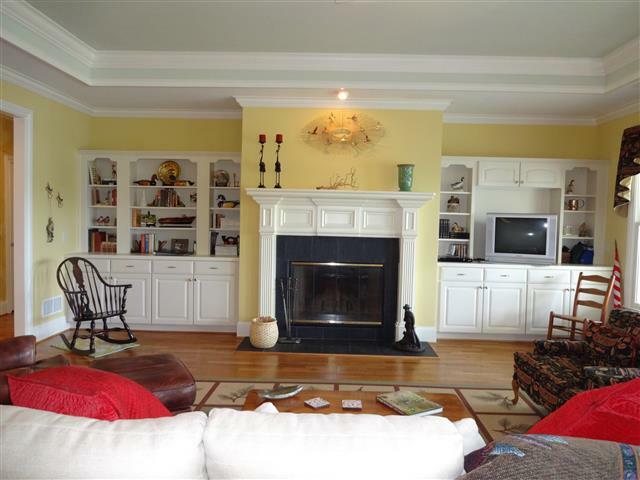 If you want to LIve Large at Lake Oconee, come see this wonderful property with large rooms and large views. For a price of $860,000 this Long Island Forest home is available for the person who wants beautiful Lake Oconee views, and abundant space for living. For more details see LakeOconee.com RE/MAX Realty. Good lighting is not something most people think much about until they don’t have it. Living in a well-lit room is a much more pleasurable experience than trying to cook, read, entertain or do just about anything in a dark, shadowy space. * Add to your task lighting. Many bathrooms and kitchens have plenty of overhead light, but are often lacking when it comes to task lighting, says David Martin, designer with lighting manufacturer Hubbardton Forge. At the kitchen sink, for example, you can eliminate shadows by including two sources of light. The result is a workstation with easier-to-see spaces that alleviate eyestrain. * Include mood-enhancing lights and dimmers. Places such as bathrooms and bedrooms – once mostly functional – now serve as an extension of our living spaces, says Todd Phillips, owner and senior designer with Quoizel Lighting. The lights in those rooms should be both hardworking and mood enhancing. For example, inexpensive, easy-to-install cove lights in the kitchen can provide soft illumination after mealtime and cleanup. Additional lights placed at a bathroom vanity and aimed out toward the face can help brighten grooming tasks and offer awakening morning light. A bonus: Those controls can help accommodate varying levels of natural daylight, too. * Increase the size of your bedside task light. One of the bigger mistakes Phillips sees in bedrooms is the size of bedside lamps – they’re either too small or not adjustable. The lamp needs to provide light where you need it, and if it’s too small it can’t do that says Phillips. Go for a larger size with increased lumen capacity. * Install track lighting for flexibility. Stationary overhead lights are fine when you need to flood a space with light, but too often kitchens, bathrooms and bedrooms lack flexible sources of light. A good solution is track lighting. You can direct one or two of the lights on the track and point them to a wall to add accent light for artwork, and use other lights on the track to create different focal points, Phillips says. * Add a light fixture for drama. A side benefit of beautiful, light-providing chandeliers and pendants is that they provide focal points. New light sources give homeowners some great options, says Phillips. You can drop in a chandelier over a bathtub to create drama and get mood and ambience too. As a bonus, those fixtures help provide the finishing touch for different colors and accents. People sometimes put quite a lot of money and effort into their rooms and lighting can help to show them to their best effect, says Martin. * Add a ceiling fan with a light source. With the flip of a switch, a ceiling fan with a light kit can improve a room’s livability with both comfort and light. It is just one more example of how light works wonders in the home. Having more lighting options creates a better lifestyle and it enriches our lives in terms of the time we spend in our homes, says Phillips.